October was the month my baby turned 5. Each year when the trees are at their most glorious and we kick through piles of leaves, I remember driving home from hospital with my newborn. Those first walks as a family of three in countryside lit in shades of yellows and reds. Finding my feet as a new mother in the crisp autumn days. This year we celebrated his birthday by building a den in the woods and playing hide and seek with a few of his school friends. It was a simple celebration and perfect for my nature-loving, stick-wielding, hide-and-seek-loving son. Also in the October holidays we enjoyed a trip to Dunkeld to soak up the beautiful autumn colours (I have to visit Big Tree Country each autumn, there’s nowhere quite as spectacular for me). We had lunch in the Birnam Arts Centre and wandered around the Beatrix Potter Garden, before heading to the Hermitage for a woodland explore. Those towering trees (some of the largest in the country) and the autumn sunshine filtering through made for lovely photos – a great day to have forgotten my camera card). It was one of absolute favourite walks and I’m not sure there is anywhere better for a woodland walk. The last week of the October holidays was spent in Findhorn with family. 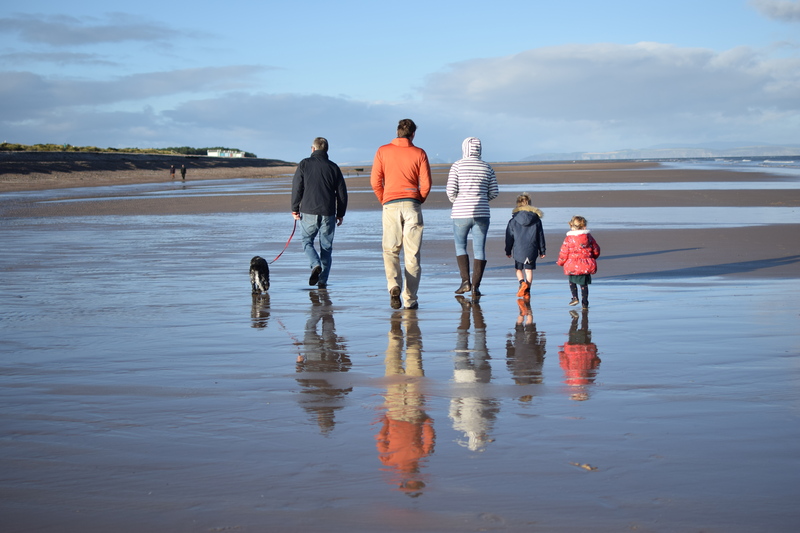 We were very lucky again to have the weather on our side and made the most of blue skies and crisp autumn days on the beach. My husband and I also spent a child-free day together in the awe-inspiring Cairngorms National Park exploring the Glenmore Forest Park. We had breakfast at the Mountain Cafe (go, you’ll love it) before setting off on the Green Lochan/Ryvoan Bothy circuit. I’ve wanted to visit the Green Lochan for a long time now (or An Lochan Uaine – otherwise known as the loch where the fairies do their washing) and it didn’t disappoint. It has a lovely turquoise colour and really is a little hidden-away gem. I loved peeking my head in Ryvoan Bothy and finding it absolutely bursting to the seams with families, cooking sausages and toasting marshmallows on a fire. And, of course, the month ended with Halloween. My little batman and batgirl enjoyed dressing up and carving pumpkins – and we went guising (what we call trick or treating here in Scotland) for the first time. These were some of my favourite moments of October which I’ve shared as part of the Snapshots and Scenes blog linky. Happy birthday to your little man! One of mine turned five in October too 🙂 Your photos in the woods are absolutely breath-taking! … and that last photo of Batman and Batgirl: priceless!